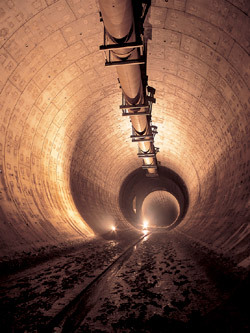 In the Kanda River Underground Diversion Channel, excess water from the river falls down a vertical shaft (above) and is stored in a tunnel (top). The Kanda River traverses central Tokyo from west to east. With a total length of about 25 km, it's only a short river, but it used to overflow its banks so often that its nickname since ancient times has been Abare-gawa ("Rampage River"). The floods caused a great deal of damage in the inner city because many people live near the river, and it was common for thousands of homes to be flooded after a powerful typhoon or torrential downpour. The Kanda River Underground Diversion Channel is being constructed to solve this problem. The channel is actually one huge tunnel built under major roads. 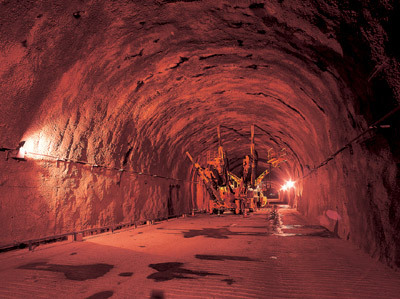 It is extremely difficult to widen a river in densely populated urban areas, but excess water from heavy rains can be stored temporarily underground in the tunnel. The plan for the Kanda River is to construct a 4.5-km tunnel (diameter, 13 m) well below street level40 meters down. Construction began in the 1980s, and the first 2-km section was completed in 1997. It can hold 240,000 cubic meters of water, equivalent to the runoff of 50 mm of rain falling in one hour. The reservoir has drawn water from the river during torrential downpours on more than ten occasions so far, and the Kanda has never flooded since it came into operation. Plans call for the tunnel to be extended to Tokyo Bay, literally creating a second, underground Kanda River. The National Kushikino Oil Storage Center keeps oil in caverns carved out of the bedrock. The 1973 oil crisis hit oil-importing countries like Japan severely. Learning from the crisis, the Japanese government issued a directive ordering the petroleum industry to store enough oil to tide the country over in the event of another crisis. The government also began storing oil on its own. Today, government oil storage centers in 12 places around the country keep 50 million kiloliters of crude oil on hand. One of these is the National Kushikino Oil Storage Center, located in the city of Kushikino in Kagoshima Prefecture. Oil can be stored in tanks above or below ground, or in the sea. But at Kushikino a different method is usedmassive caverns carved out of the bedrock are used to store the oil, 42 meters below ground. There are three caverns, each measuring 18 m in width and 22 m in height. One cavern is 1,100 m in length, the others twice as long. Together, they have a capacity of 1.75 million kiloliters. The temperature does not have to be regulated because the underground conditions keep it steady at about 9°C. Other advantages: the caverns can resist earthquakes, can't be hit by bolts of lightning, and have almost no risk of leakage.